VVDI2 Covers All the Functions of VVDI, VVDI 5th IMMO Adapter, BMW Multi Tool, CAS Plus, CAS4 Adapter, Tango, J2534.VVDI2 support more powerful functions and vehicles than vvdi, such as BMW, Porsche. And VVDI2 commander supports online update for both software and firmware. From now one,buy VVDI2 Full (Item NO.HKSV86) version,Get Free VAG OBD Helper. VAG OBD helper up to the VAG vehicle (VW, Audi, Skoda with 4th IMMO) , you can quickly get immo data within 3-5 minutes by connecting the internet ( The time depends on the network status or the number of users), which is easy to operate, help save time and avoid the risk of disassembling the dashboard. 1. VVDI2 full comes with Basic Function + VW + BMW + Porsche+ AUDI Generation 5 function+BMW OBD Fucntion+BMW CAS4+ function, If you also need ID48 96bit,ID48 OBDII,BMW FEM,Please check VVDI2 Full Authorization one. 7. Free active the pin, cs, mac authorization and change remote database English language. After you receive VVDI2 Full,please provide VVDI2 serial number. 8.MQB Key Learn authorization free.KM function is OK to use.But ID48 authorization still need to purchase. 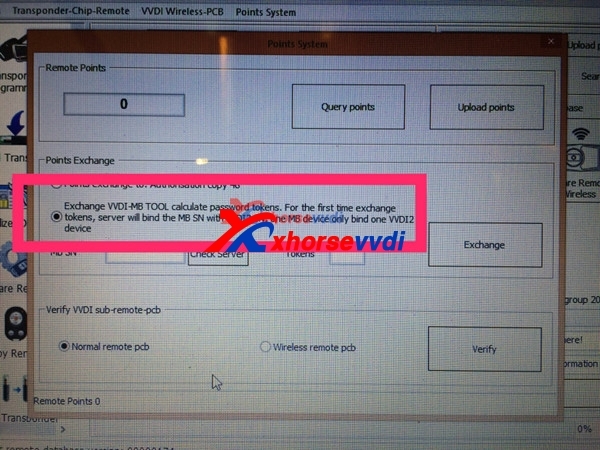 9.Free Get VT-01 Toyota H Chip authorization,please get by yourself:xhorse update kit software bind,log in Customer Self Service,click Activate H.
1.Xhorse VVDI2 need internet support and require authorize for Condor Automatic key cutting machine: OBD read MED17/EDC17 PIN / CS / MAC, calculate OBD data online, calculate EEPROM / FLASH for PIN/MAC/CS. Only when you provide us the serial number of Condor MINI key cutting machine, we can open the authorization to read pin, cs, mac. 2.It connects to the server and synchronizes once every 31 days. This process is done automatically by itself for 1 day, internet connection is required for this process. 3.If you want to add VVDI2 BMW FEM/BDC function,price is 200USD. !!! VVDI super chip is released, require V6.5.0 software !!! 5.programming FEM/BDC system, require soldering and get eeprom. (FEM 95128 chip, BDC 95256 chip) usually there are 2 same chips on the module, please refer to the software diagram, select the correct one. 1,2,3,6 as picture shows, 4 and 5 need to buy separately. I successfully added a key bcm2 on a 2013 audi a5. Audi BCM2 add spare key by obd worked fine, and I did one on a 2013 A5 and it worked flawlessly. A6/Q7 EZS Kessy: Added a dealer key (remote sourced from the dealer) without issues. Seemed to read everything properly but I had a working key to begin with. Skoda Octavia 2006: got CS & PIN , programmed key fine, but not remote programming. VW passat. B5: Pulled PIN, programmed key, corrected miles. VW Passat B6 2009: Pulled PIN but couldn't get 6 bytes CS, needed comfort dump. VW Transporter T5 2006 : Pulled PIN Programmed key, no remote programming. Audi A4 2006 : mileage correction success . Audi A6 2003: Mileage correction fail. car not start. remove battery terminal. car start. Had no problem with precoding and programmin 2 keys for 2014 Jetta today. Worked well. I tested my vvdi2 on 2008 bmw m6 today. It worked flawlessly and was a bit quicker than multitool. VVDI2 calibrate mileage on golf5 visteon dash by obd. turan 2015 read immo data km change ok.
vvd2 programme keyless key Audi Q5 year 2012. keyless function will work. VVDI2 do mileage on A6 2014. And test Cluster A3 8V in Golf 7, immo working, protection component active. I did turan 2015 All ok to correct mileage in mqb platform. done today 63 plate octavia, no problem all ok.
2x Caddy 2014 white color IC, all keys lost done today, service mode solution. Vvdi2 + Vvdiprog .They are for retrofiting golf 5 . Working good. I have successfully programmed numerous Golf’s and an Audi SQ3, all had a working key and all the new keys were ordered from the dealer (TPS). Process was flawless except for one of the Golf’s which had a Johnson controls dash and VVDI gave me a message that this was in development. you vvdi2 in fem have function change fem.it is 100% work.i try. I successfully did a ALL KEY LOST on Audi A3 /S3 with Micronas cluster recently. Peugeot 508 2014 proxy key pin read ok.
For f30 f20 434mhz i used this key,work 100%. for people not able to make key by obd for landrover now can make on bench with vvdi prog + vvdi2,most for 2014/2015/2016 year. VVDI2 unlock toyota smart key 80bit successfully,but present V4.1.0 VVDI2 software Unlock Toyota Smart 128 is not available,will develop in future. How to use VVDI2 Programmer Read Peugeot 207/307 Pin Code? How to use VVDI2 Program BMW Cas 3 Key? Q: How to solve VVDI2 BMW Software Database Update error?software and firmware already the latest version? 1.Q:Customer gave us feedback that can not understand the page,it is not English,not Russian.What is it? A:Currently about VVDI2 prepare remote function cannot support english database,only Chinese database.still developing this function. 2.VVDI 2 shows "remaining synchronization time: 17 days",what is it? A:It means after you activate it to use,it already use for 13 days.And when it comes to 0 days,you can connect with internet,it will automatically change to 30 days again. It connects to the server and synchronizes once every 31 days. This process is done automatically by itself for 1 day, internet connection is required for this process. 3.When i do MED17 function,it shows need authorization for condor,what can i do? A:It needs to bind with condor key cutting machine. The following function listed in Xhorse VVDI2 need internet support and require authorize for Condor Automatic key cutting machine: OBD read MED17/EDC17 PIN / CS / MAC, calculate OBD data online, calculate EEPROM / FLASH for PIN/MAC/CS. 4.What is Xhorse VVDI2 Programmer Points System?it asks to bind vvdi2 and vvdi mb bga tool. Exchange VVDI MB Tool calculate password tokens.For the first time exchange tokens,servcer will bind MB sn with VVDI2.One MB Tool device only bind one VVDI2 device. A:If you use Xhorse Remote/key and add to car, every key give you points. Then you can exchange points.And points are OK to change to tokens. Points system is only OK in China at present.As well as vvdi2 remote keys.When vvdi key tool in stock,and vvdi2 newer version release,this will be OK.
How to check VVDI2 Point System? Enter into VVDI2 Transponder Programmer software,you can see Ponits System. Or you can go to xhorse update kit software,click bonus points to check.